The coffee table styles pictured below and on the next pages can be designed and built for you in the dimensions of your choice. Tina welcomes commissions to custom build and custom weave furniture. Contact Tina directly to commission a custom-designed coffee table. 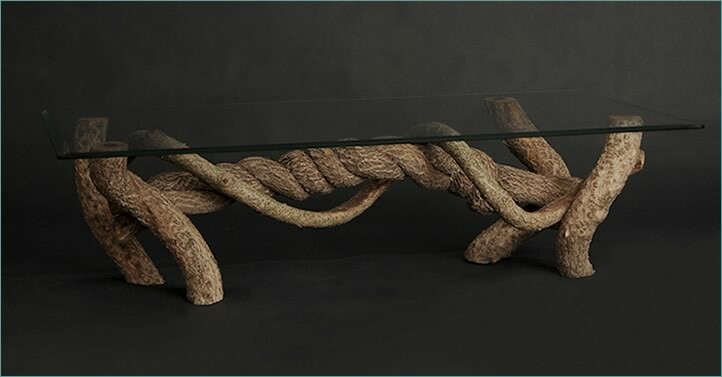 H 13" W 44" D 18"
This simple but elegant coffee table was made from 3 pieces of bittersweet vine. One for the sturdy, curving legs. One tightly twisted corkscrew-fashion to create the table's focal point. And a third, gently twisting around the "corkscrew" to balance the design and accent the center. The table's design appears to defy the laws of gravity! Designed for a beveled piece of glass 24" x 48," which is not included.